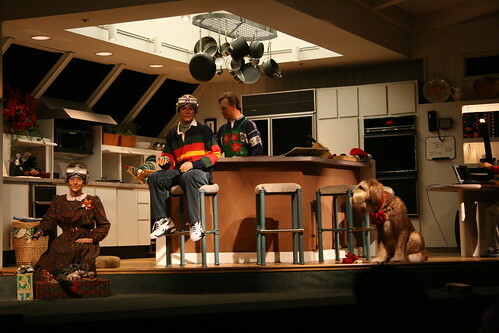 One of Doug's favorite attractions at Walt Disney World's Magic Kingdom in the Carousel of Progress. It chronicles the state of technology from the 1900's to "today". I, of course, take the opportunity to practice my low light photography. Here are thirteen photos and videos of the ride. The 1900's without electricity. 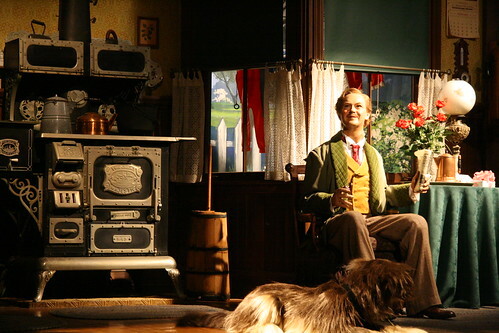 They did have gas lamps and a kitchen pump. 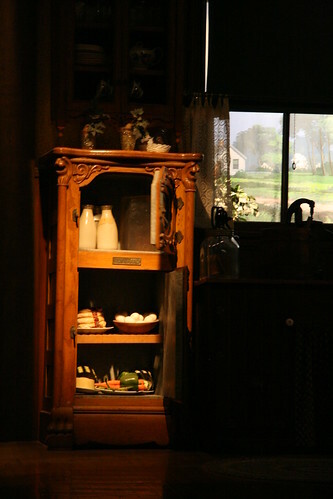 The ice box of the 1900's was just that, a box to hold a big block of ice and some food. My question is where exactly did they get blocks of ice in the summertime? Good thing I live in the 2000's and there are Yahoo! Answers. The collapsible ironing board was invented in 1892, but hadn't come to this family yet. 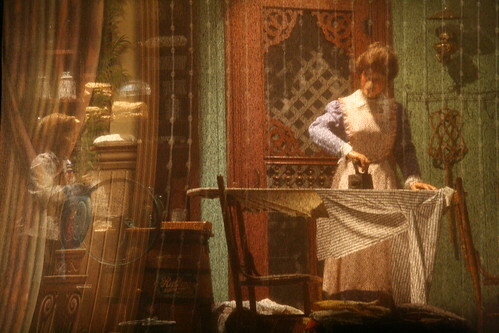 This scene was behind a cloth screen which was lit for a few moments. 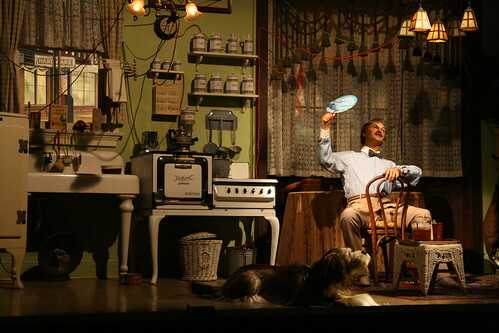 In the 1920's, houses began to have electricity, but it was not very reliable. This kitchen was strewn with wires everywhere which kept shorting out. 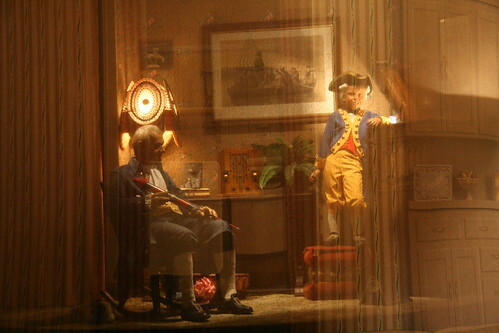 Jimmy and Grandpa listened to the radio. 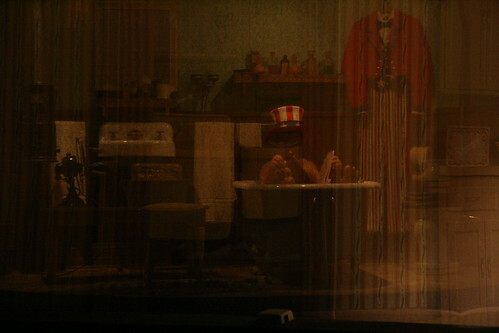 I barely captured Uncle Orville in the tub as the lights were going down. The 1940's brought much modernization and the beginning of the rat race. This video shows the transition from the 1940's stage to today's. 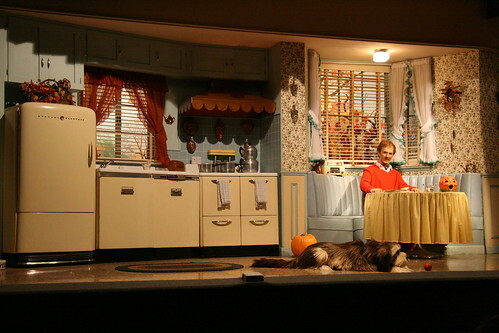 And we get to hear that song, There's a Great Big Beautiful Tomorrow. 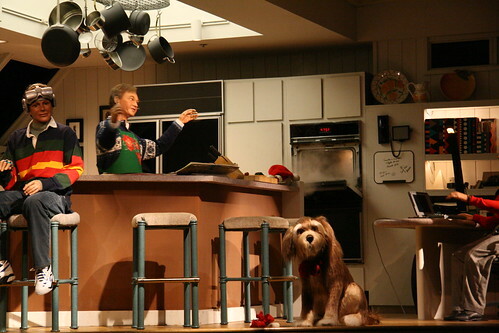 The kitchen of today is full of high-tech conveniences. But I guess pots and pans are still here to stay. Grandma plays a virtual reality space game. In my reality, grandmas love Bejeweled. Here's Christmastime of today. The rear entry ski boots are hopelessly 80's in my opinion. The turkey got burned at 975F because of mistaken voice commands. Last but not least is this video at the end of the ride. I tried to capture Doug's rapt expression, but it was too dark. Bye-bye, see you real soon! Yes, I know I've drunk the Disney Kool-Aid. Post note: Just found out that Thursday Thirteen is no more. Oh well, just one last one from me!